Remember the 80s? Or at least enjoy some classic 80s rock and pop? Maybe you'd like to hop on down to The Classroom for a near nostalgic experience listening to some 80s tracks. They say they don't make music like they did back in the 80s. 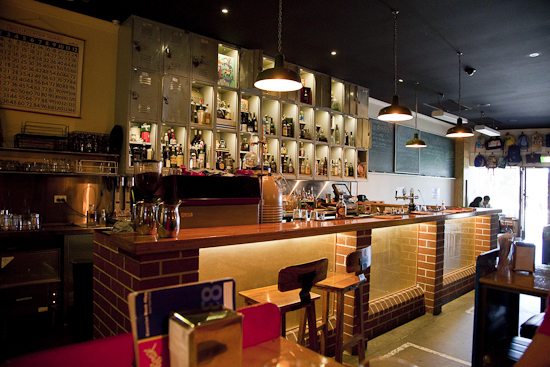 The Classroom is a niche bar/restaurant in North Perth that has serves modern bar food and a widely ranging drinks menu. If you're in the mood for a drink, you'll definitely want to look through the cool cocktail list that describes most cocktails with mini essays. The creators of The Classroom are from Cocktail Gastronomy and there are some classics to be had, and even cocktails made with bunsen burners and blow torch. With a name like "The Classroom" you wouldn't be surprised to suspect a classroom or school theme. The Classroom offers a nostalgic experience with a collection of schoolies memorabilia including lockers as the bar shelves, blackboards, multiplication tables, backpacks, encyclopaedias and sporting trophies. Bringing it all together to an era, music from the 80s (at least when I was there) is proudly played audibly throughout. As many of these niche bars do these days, The Classroom offers a menu of mainly modern share dishes - though keeping with the theme, the menu is contained in a student exercise book. The dishes range from small almost entree like dishes, through to larger almost main course sounding dishes, as well as sides and desserts. The selection isn't huge, but there is a good range of food offering different types of meats and seafoods as well as vegetarian and gluten free dishes. Portion sizes aren't large so if you're hungry like a starving wolf you could find yourself ordering several dishes to satisfy. The service was generally fine - of the two wait-people who served us, one was very professional and helpful whilst the other seemed a little short with responses but otherwise no big issue. No, they aren't dressed like any school teachers I had. The four chicken drumsticks had their bones snapped off around the smaller and less meaty cartilage area (which also left some not-so-pleasant sharp edges and a couple of small bits of loose bones on the drumsticks). Each drumstick tasted like they had been grilled, the outer skin and meat having a slight grilled texture and dryness to it, though the skin was not crispy. The chermoula flavour was subtle, with the chicken retaining a lot of its flavour without much to cover it. 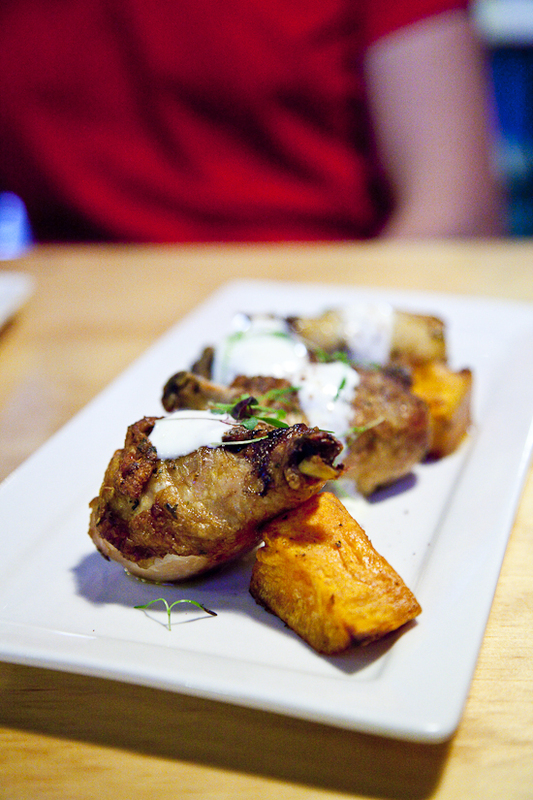 The dish also came with two small chunks of each of roasted sweet potato and eggplant. Both were firm and held their shape, yet both were effortless to cut through and eat. For me, the sweet potato in particular deliciously melted in my mouth with the sweet flavour of the sweet potato mixed with in with the light seasoning. Spooned over the chicken was some zesty acidic yoghurt, complimenting the (light) chermoula flavours. The squid was made up of pieces of squids body as well as squid tentacles. The squid were lightly dusted and fried, but like the chicken drumsticks the seasoning was subtle. The squid was tender, whilst the outer coating was only lightly crispy. However, remembering how hot some szechuan pepper dishes can be, I couldn't really say the szechuan peppers came through for me - suffice to say those of you who can't take spicy dishes shouldn't let this dish's name deter you in spice factor alone. 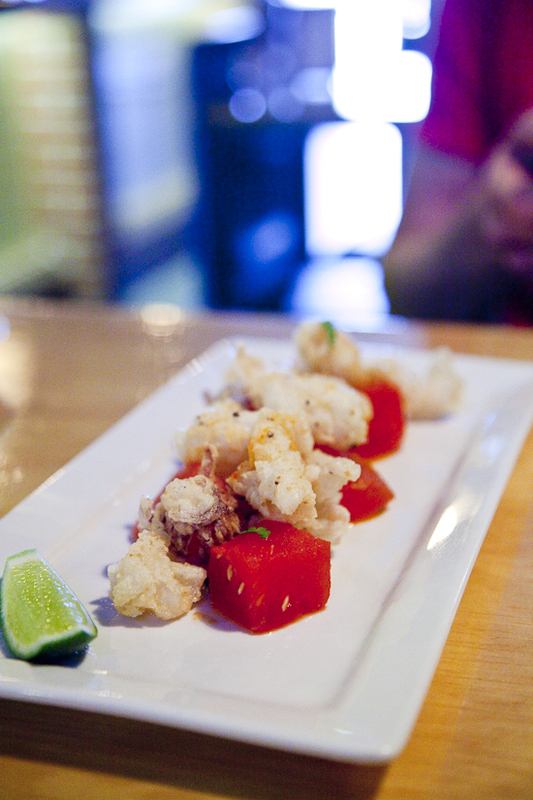 Served with the squid was "compressed watermelon" that was as the name suggests quite dense for watermelon, and seemed to have been coated or drizzled with some lime juice. 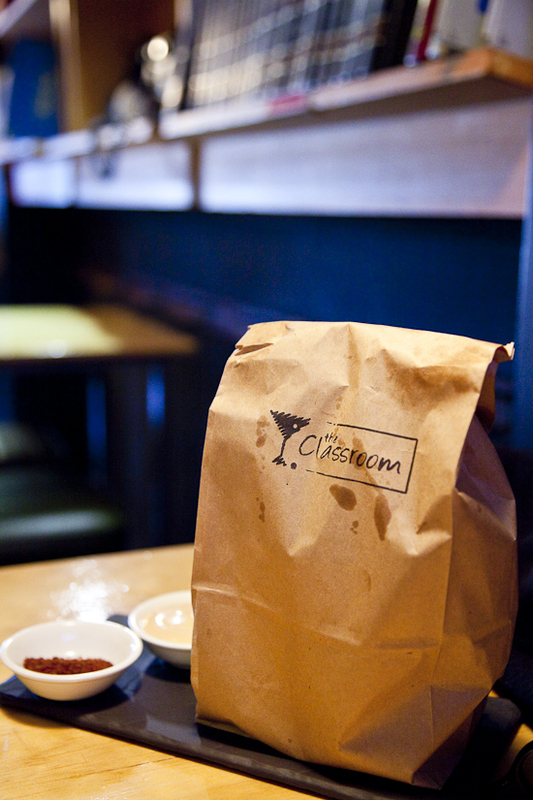 The chips were served in a brown paper bag, with "dynamite dust" and chipotle aioli on the side. Presumably the "shaker" aspect gave you the option to toss in the dynamite dust (which seemed to have more paprika flavours than a spicy kick) and shake them up. Inside the bag, the chips were placed in a chips cup. The chips themselves were hand cut chips where you could still see the potato skin. 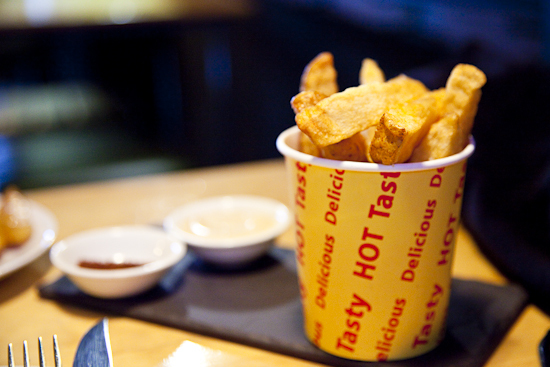 The chips weren't crunchy, but were more like wedges in texture (but with thick chip sizing and cut). With its neon blue flame pouring between gleaming steel mugs, few cocktails are more visually impressive (and dangerous) than the blue blazer. The blue blazer contains over-proof bourbon, raw sugar, seasonal fresh fruits and liqueurs to hand. 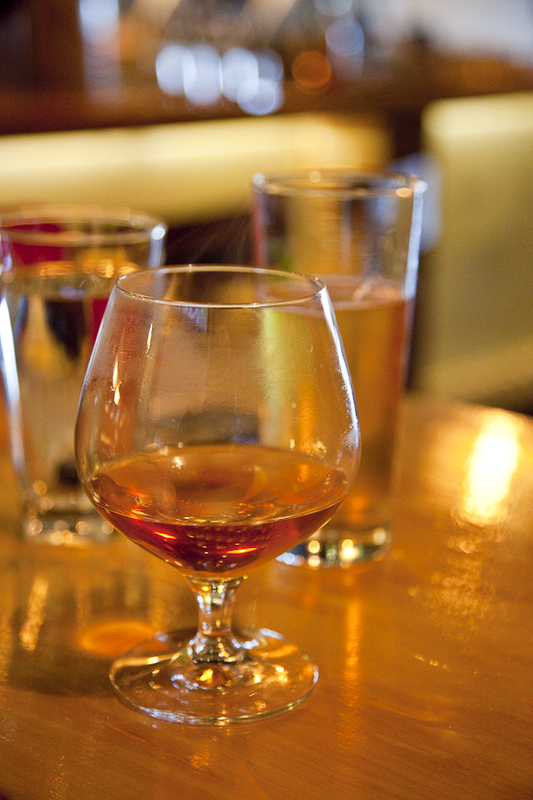 The drink itself had a strong bourbon taste, and was sweet, smooth, warm to touch and nearly a thick consistency. I found it to be quite comforting and it went down a treat. We liked: The memorabilia and (for some) the nostalgia; the interesting and special cocktail selection (and history/stories). We didn't like: Not a lot of seating available when it gets busy (you can't RSVP and sharing tables is encouraged). Other things to note: The bar is fully licensed; there is parking at the rear (but drive responsibly); the menu probably isn't that extensive for a full on dinner meal.